She was also extremely prolific, writing 40 collections of almost 800 poems, most of which no one had ever seen until after her death when they were published by her family. No one really knows if she wanted to have her poetry published or not. (2) While she was alive, she only had 10 poems and one letter published anonymously, and those were probably the result of others submitting them without her knowledge or approval. Now, hear me, Gentle Readers, when I say this: I am in no way placing myself or my work anywhere within the same league, let alone the same ballpark, as this talented and creative genius. There's no comparison. But I do feel a kindred spirit with her, perhaps. Lately, I find myself wanting to retreat, stay home, and distance myself from people. I love my tribe. I care deeply about people. But loving people is also messy and exhausting. It takes work. It takes time. And it's scary. You have to be vulnerable. You have to be honest. You risk getting hurt. I'm not a terribly good liar, but I'm very good at hiding. Being both introverted and shy by disposition, combined with years of childhood teasing and bullying, all taught me that it was easier, and less painful, to be very quiet and keep to yourself. Avoid social situations and don't ever let anyone see how you really feel or think. It works, up to a point, but it's also very lonely. Especially if you also have a natural disposition to be very compassionate. Text messages, emails, Facebook messages, and (I'm smiling as I type this) blog posts, only go so far in connecting you to others. It's all very artificial. So, I have the reclusive tendencies. I also have a track record of writing and creating things that I never show anyone. There are so few people who have read my fiction writing or poems, that I can count them on one hand. I have portfolios full of artwork that I have shown to hardly anyone. I suspect this also stems from a fear of rejection or of being misunderstood. I haven't really figured out the motivation behind it yet. I recently joined a very small writing group. There's only three of us, including me, and one of the others is a good friend. Yet the whole process of showing them my work has been terrifying - and this has been in what I consider a very safe place. Ugh! We've also been discussing publication goals - which means not only showing my work to complete strangers but also those who are authorities within the industry which is all kinds of unsafe - and it has me quite torn. 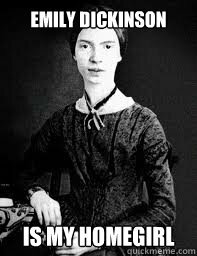 Part of me wants to be like my homegirl, Emily Dickinson, and tuck away in my room, enjoy the process of writing a bunch of stuff, and letting someone else deal with it when I'm gone. Why face potential (and highly probable) rejection? However, don't we write for some type of connection? To elicit some kind of emotion? Can that be done in a vacuum? Isn't that what writing or creating art is all about? Furthermore, isn't connection and love what human relationships are all about? So I keep pushing my comfort zones and trying to best navigate whatever time I have left here. Does that mean my short story will end up on your Kindle reader? Or will only a few key friends ever see it? I don't know. Does that mean I'll end up wearing nothing but white dresses and hanging out in my attic? (3) I hope not. I'll leave that legacy to Ms. Dickinson. Black is more my color anyway. should be no surprise that I listen to music while I write or paint. 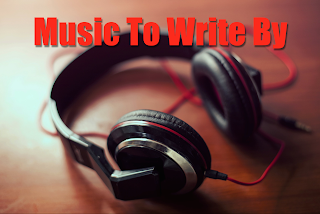 I was thinking about this quirk of mine recently, as I queued up my iTunes playlist, and wondered if other writers found music distracting or helpful. I know that in his book titled On Writing, Stephen King says he writes while listening to Metallica, AC/DC, and Guns 'n Roses. I smile just thinking about that. When I did a quick Google search of famous authors and what kind of music they like to listen to while they write, there were three answers I saw repeated over and over again: 1.) nothing, 2.) classical such as Bach and Mozart, or 3.) the Beatles. I suppose genius inspires genius? When I'm painting, I usually listen to whatever fits the mood I'm in, and the music isn't really related to the subject matter of my painting. When I'm working on a brand new piece of writing, I gravitate towards listening to classical works. In both cases, the music is there to simply drown out the rest of the world and it helps me to focus somehow. However, there are times when I'm writing, when the music I listen to is purposefully selected and intricately connected to what I'm working on. For example, I recently wrote a short story that utilized some of my experiences from college. Thanks to the power of iTunes, music from that period of my life pulsed in the background as I plucked away on the keyboard. Then there are those certain characters, the ones that live and breathe outside of me, the ones that I feel like I'm taking dictation from instead of creating myself; they practically demand a soundtrack. I have a playlist for one angry character, Jeremy, that is full of rock music that I just know he listens to whenever he is in his car, with the volume turned up as loud as he can stand it. Every time I go to write a sequence featuring him, I turn on his music and once I hear it, I can settle into his skin. Not only does the style and tone fit who he is, but most of the lyrics in some way reference him, his personality, or what has happened to him. There are also certain locations within my stories that demand a soundtrack. I will hear a song and think, "The feeling this song evokes is how I feel when I'm visiting 'the forest', or 'the mansion', or 'the high rise', etc." So I have several location-based playlists as well. The music is a type of mental shorthand, a way to clear out the noise of my day and to tap back into that character, or that environment. How about you? Do you find music a distraction or a helpful tool when you sit down to write (or paint, or craft or create)? Just for fun, if you would like to listen to Jeremy's angry playlist, I've replicated most of it for you on Spotify. (Although it looks like the band, Tool, isn't on Spotify.) Just click below, hit shuffle, and enjoy - but be sure to turn it up to 11!